Because the heater expands when installed in manifolds with bends, you will need to calculate the correct straight length. Proper length depends on how many bends in the heated path your manifold has and the radius of each bend. Accounting for heater expansion will prevent heated sections from sticking out past the manifold and shortening the heater’s life. Below, in figure 1, is an example of a manifold with the straight lengths marked in red. The bend groups are marked in green, blue, and orange. Step 1. Identify and measure the straight lengths. Step 2. Identify the bends and measure each radius. Step 3. Adjust bend section measurements for anticipated heater expansion. 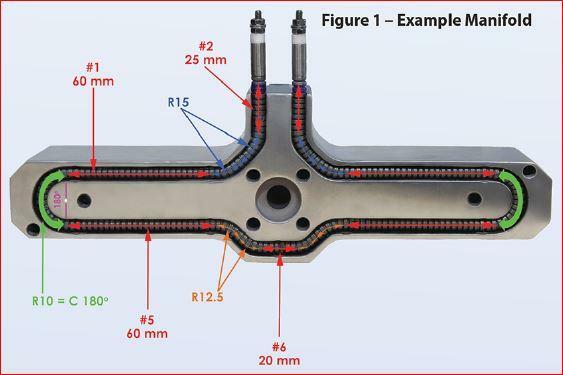 To adjust for expansion, you will need to identify the diameter of your manifold groove, (See Figure 2). Repeat this process for each bend group identified in your manifold. Step 4. Add straight lengths (from Step 1) with all adjusted bend lengths (from Step 3). Step 5. Identify the correct stock part number. 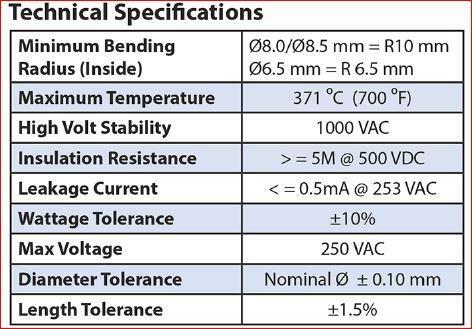 In the example above, the total heater length is 583.266mm. Rounding up the the next size, the correct length is a 600mm heater or part number 80R-0600. Following these instructions, you can be assured you will not have heated sections sticking our of your manifold. NOTE: IF your total adjusted heater length is less than 10mm from the next size up heater part number, you will need to move up two sizes in length from your calculated value. For example: your adjusted calculated heater length is 648mm, then you should select the 675mm heater instead of the 650mm one. Call Jobco for ordering questions and pricing at 479-424-1300.